Veteran educator Paul Dingeman was in front of a class again – but this time it was an eager group of history buffs chomping at the bit to learn more about Lookout Mountain on the northeast edge of Spearfish. But the northern Black Hills landmark has a rich history, and Dingeman shared much of it with a packed house last night (2/2/10) at the Spearfish Senior Citizen’s Center. Dingeman, who was born in Deadwood and raised in Spearfish, recalled hiking up the mountain numerous times as a youngster – even collecting a jar full of rattles from rattlesnakes that he’d encountered along the way over the years. He recalled as a 6th grader, he had to write a paper on Lookout Mountain, so he enlisted the aid of two older ladies – the “Massey girls” – who ably shared several yarns with the lad and later came to school to address the students. The Masseys told of the early days when settlers would send lookouts to the mountain from a stockade – located about where Roma’s restaurant is situated today. They would use mirrors and smoke signals to communicate with folks back at the stockade, warning of Indians or other perceived dangers. 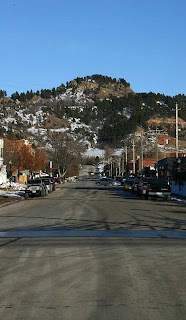 The mountain was referred to as a “she,” and because of its shape, “she” was deemed our “protector” and referred to as the “queen of the valley.” Thus came the origin of “Queen City” when referring to Spearfish. 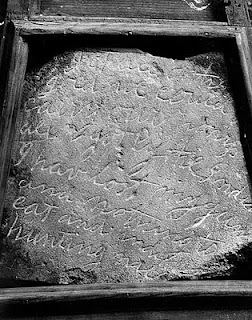 Dingeman spent considerable time relating the mystery of the Thoen Stone. Discovered by Louis Thoen in 1887, the block of sandstone was found concealed near some oak trees on Lookout Mountain. On it was etched a message by one Ezra Kind, saying that he and his group had found “all the gold we could carry” in 1834. Alas, the message went on to report that all but he were killed by Indians, and that he had nothing to eat, no horse, and the Indians were hunting him. Over the years, the validity of the story has been challenged, but researcher Frank Thomson, in his 1966 book “Thoen Stone: A Saga of the Black Hills,” defended the Thoen story. And so it is that the stone (shown at right) has remained something of an historical controversy, and its authenticity may forever remain a mystery. It is among the many wonderful exhibits in the Adams Museum in Deadwood. 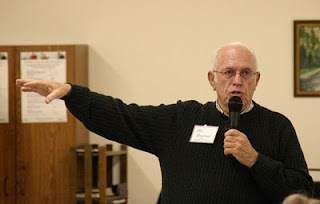 In the 1950s, Dingeman was scoutmaster of Boy Scout Troop 17 and Explorer Post 254. At the request of Frank Thomson, Dingeman shepherded his lads up the mountain where they roped off sections and commenced to dig nearly a foot deep in search of artifacts – and they came up with plenty – a pistol, a dutch oven, buttons, shovels, spent rifle casings and “all kinds of stuff.” Thomson took pictures of the findings, which were reportedly delivered to the Adams Museum in Deadwood, but Dingeman says they’re no longer to be found. Dingeman said his mother-in-law, years ago, bought a “high-powered” metal detector and convinced him and a brother-in-law to search atop Lookout Mountain for any "Thoen gold." Alas, several long weekends of searching netted no booty! While Deadwood would seem to have the corner on colorful wild west stories in Black Hills, Spearfish is not without a few of its own stories. Dingeman shared the story of two cattle thieves, caught at the foot of Lookout Mountain and dragged to a couple of nearby oak trees, where swift justice was exercised. Perhaps less colorful – but just as contentious – were the struggles for routing the new Interstate Highway through Spearfish. Early plans had called for routing the superhighway to the east of Lookout Mountain – headed for Belle Fourche – before swinging back to the west toward Wyoming. After much local advocacy, highway officials changed the route to the west, but taking a route through the heart of the valley, near the site of the hospital today. Homestake Mine intervened, reminding officials that they’d have to guarantee safe delivery of all water in some 87 irrigation ditches that snaked through town. Government officials relented and moved the highway back up to its present track on the west side of Lookout Mountain. More photos and a bit more information can be found in our History Gallery of the Spearfish Area Historical Society.